Brave Nina says she's doing “okay under the circumstances”. It’s going “okay under the circumstances” says the brave Nina (Niandri) van Rooyen. The wave of support has kept her since her husband Jason Sanders passed away as a result of brain and spinal cancer on 7 November. 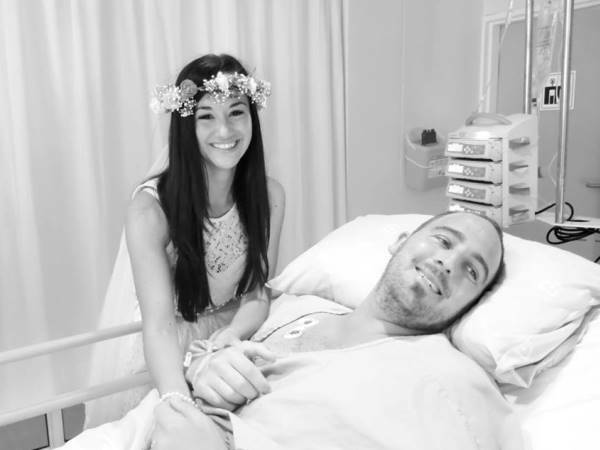 They married each other in hospital on 27 October. “We are so grateful that people are thinking of us in this time…And are still praying and sending us their condolences…We couldn’t wait to get married in church,” says Nina. People attended the memorial service, which took place on 11 November at Hillsong Church in Century City, Cape Town, in their thousands. Everyone wore blue, which was his favourite colour. It was just a sign of how many people he had touched. Yesterday a whole lot of people braved the oceans at Bloubergstrand on surfboards, because he so much loved to surf there. His passing even inspired a hashtag #blueforjay (his nickname was Jay) which people used to show their support and help Nina raise funds for his medical expenses, other expenses and the house which they bought together. Jason had taken out a life policy but it was cancelled shortly after he was diagnosed with cancer. Their dream, before he got sick, was to get married on Nina’s 27th birthday. 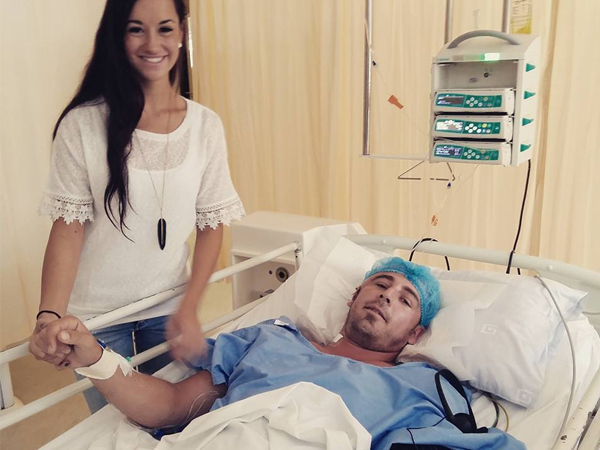 That was the day after Jason died at the age of 32, in a clinic in Durbanville, just outside of Cape Town. “My beloved husband, a brother, son and best friend to many sadly passed away today 7 November 16:25,” she announced on Facebook after his passing. “Family and friends came from near and far to support Jason in his fight against this heart-breaking disease. It is clear how many lives he had touched with his bubbly personality and caring nature…” she wrote. His mother, Nicolene Haley, came from Australia to support them and is now one of Nina’s pillars of strength in this difficult time. The family is going to spend Christmas together. Nina and Jason had been together for three years. They bought a house together in October last year. “We were so looking forward to a life together,” says Nina from Table View. She and Jason had met each other at work, when they worked for the same telecommunications company. But she was forced to quit her job to look after Jason when he became ill. In March he was diagnosed with an aggressive and terminal form of brain cancer. He had an emergency operation to remove the tumour, and he needed radiation and chemotherapy too. “The doctors gave him a few months to live,” recalls Nina. “They said that it was the most aggressive and fastest growing tumour they’d ever discovered. But a scan performed in October showed that the tumour was shrinking and he would only need to return to the hospital in October. “Things had started looking positive for us and on 1 August we got engaged.” They were to marry in the NG church in Bloubergstrand, everything was already booked. Then Jason started complaining about unbearable back pain, neck spasms and nausea. When a scan was done last it showed that the cancer had spread to his spine and he needed another series of radiation, chemotherapy and more surgeries. But then he died so unexpectedly. “Jason taught me to be positive. People’s prayers have carried us. We’re grateful for that.” His medical aid was exhausted. Benefactors are still putting money into a trust fund to help Nina. More information can be found here.